What a long hiatus since the last post. I offer up sincere apologies for this. I won’t bore you with the reasons why both Archie and I (mostly me) have been pulled away for some time. However, I would like you to know that although there were no new posts on this site, Archie has continued to work on this project (at my bidding) and I have continued to transcribe his work. Life events have distracted us a bit over the past couple of years, but now I plan to be back here on a regular basis. I hope you will join us! I have added some photos to the galleries. Take a look! 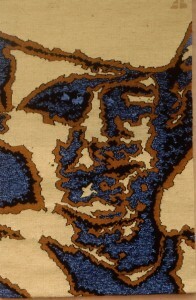 Last fall Archie had a very serendipitous email communication with a tapestry weaver. It is a small world…. “On Friday I got an email from a weaver on the West Coast, who said she had been looking online for information about the instructional DVD when she saw an image of my tapestry, “Hello, Sailor.” She was convinced that the man in my tapestry was her father. She emailed me and attached a photo of her father that was taken about 10 years later than my tapestry, and I recognized him as the same man who was the subject of that particular work. She told me that when he got out of the service he married and had three children, one of which is her. It’s been a while since I’ve posted (computer problems…), but there has been lots of progress on the book project! Here’s an excerpt from Archie’s notes! A first glance at this tapestry may suggest that it is based on cubism, but it grew from the reality that when drawing on paper you get the space between any two lines or marks that you make for “free;” ie, it is the untouched paper. 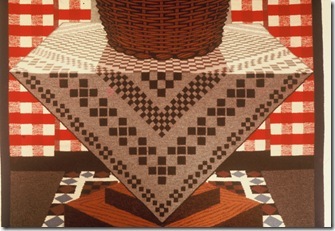 When weaving tapestry however, that “space” has to be woven, sometimes even before the drawn lines or marks get woven. And it is not an anonymous space. As part of the tapestry cloth it can have a very positive presence, a presence that can be orchestrated to have an important role in the overall work. Pictorial drawing on paper is essentially about the illusion of form, volume and space. In this tapestry the major concern is the interplay between this illusion, the seated female, and the real presence of varied cloth surfaces. 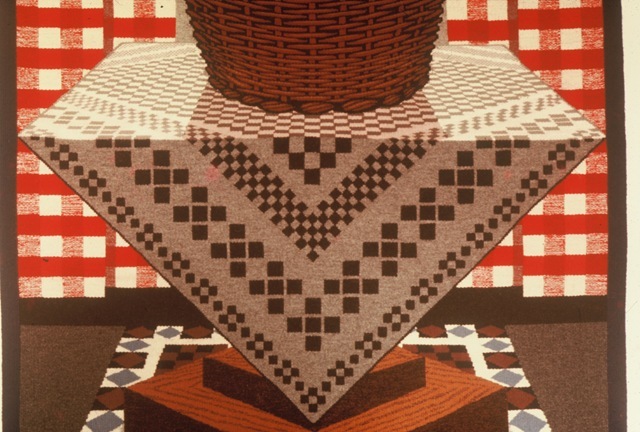 It builds on this spatial contradiction and the picture plane—here, a heavy tapestry cloth. 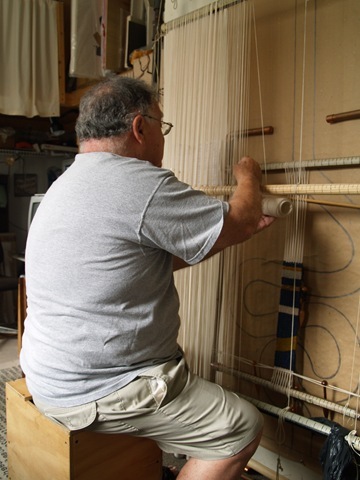 What’s on Archie Brennan’s Loom Right Now? ….like his drawing series, his postcard series, his historical series. There will be more about his series in upcoming posts! Archie is making a 3-selvedge warp for a large project. The cartoon is behind the loom on brown paper. There is also a small loom in between the loom Archie is warping and the cartoon, on which he made some woven color studies. This warping process is quite involved. The rod at chest level shown in this photo is wrapped in a certain way to create a selvedge. 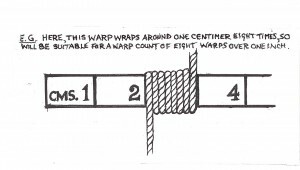 Instructions for making a 4-selvedge warp can be found on Archie and Susan’s website. Archie holds the entire spool of cotton seine twine as he makes the warp, carefully tensioning each wrap as he passes the spool over the top of the loom, around the wooden dowel in the middle, then around the bottom and back up to the top. The wooden dowel can be moved as the weaving progresses to allow the already woven section to be turned to the back of the loom. 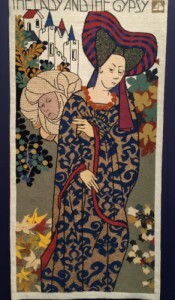 This tapestry will probably be exhibited at GAGA Arts Center in September. 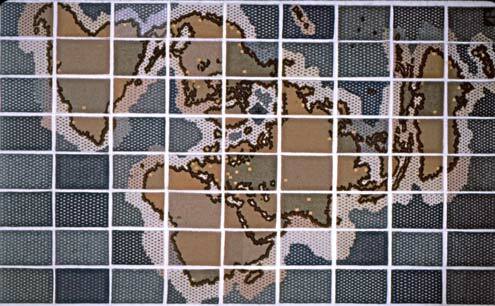 Artists’ Lectures: Fri. Sept. 24th starting at 6PM. You may have noticed that the photos in the gallery are not high resolution and do not magnify when opened in a new window. At least I have access to all of Archie’s photos, and a few of us are working toward having better photos soon! I hope you can be more patient than I am! What follows is an excerpt from Archie’s recollections of a fascinating part of his years in France. Subsequent posts will cover the other portions of his stay there. Come winter, I hitchhiked to Paris, and in time was asked to weave a tapestry for a fascinating man who ran what was surely the first hippie group ever. 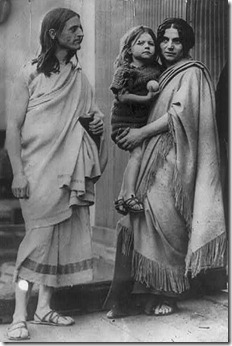 Raymond Duncan, brother of the late dancer Isadora Duncan, had formed a commune in Greece, pre-WWI. Around 1919, he purchased a very valuable piece of jewelry in Berlin, resold it in Paris at a huge profit and bought an entire old town house on Rue de Seine. 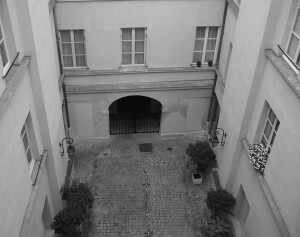 It was a classic grand Parisian townhouse with a private cobbled courtyard surrounded on four sides by three floors housing all the activities of the commune: bedrooms, library, weaving studio, hand printing press, painting studio, dance studio, dining hall, kitchen, etc. The courtyard was Raymond’s stone carving area. Daily he was there, in his seventies, wielding his seven pound hammer and stone chisel. Along with the main leaders of the commune, he was always dressed in a loose, long white, handwoven linen toga, tied at his waist with a silver braided cord. His long silver hair and thick lens glasses, and his short, slight build did not conceal his physical agility, endlessly chipping away at his large sculptures. The commune’s income was provided by a changing number of members from around the world, mostly older, wealthier women, at times accompanied by their husbands. I recall in great detail a trip to a major super market to purchase some lengths of light wood to adapt the floor loom I was to use. There were three of us. We drove across the town in a large new diesel Mercedes owned by a very slight, short Japanese-American husband of one of the commune guests. We wandered in line through the big store: Raymond leading in his toga, the Japanese man immaculately dressed in a beautifully tailored black business suit, white shirt and tie, and I, lagging behind trying to appear as if I were not part of this trio! My agreement was to live in the commune, eat in the dining hall (a totally vegan diet! ), and be paid every two weeks. On pay day I would go out alone to have a large meal of steak, cheese and a litre of milk. The communal meals were extremely simple, held in a dining hall with two long tables. The cooks were American, full time “members” of the commune. We simply stood in line and our plates were filled with a range of vegetables, cooked and/or raw, then fruit. We drank water. I cannot recall what breakfast was, but I am sure there was no coffee! 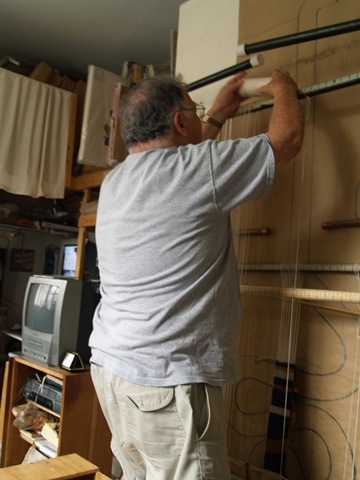 There are no photographic records of my weaving with Raymond. At that time there was no way I could afford a camera! Somewhere there must be a publication or book on Raymond Duncan. * The commune worked by offering the experience of a lifestyle for paying guests, and they had further income, I guess, by Duncan’s occasional return to tour around his original home base, giving dance threatre and lectures around San Francisco. The domestic set up in Rue deSeine was good. I had a huge personal, third floor room, and a well lit weaving studio. Raymond was more of a philosopher than an artist, but I wove from one of his paintings that he had once exhibited in the Salon de Refuse where many later successful artists, like Picasso, had exhibited when rejected from the annual French Academy show, probably around 1908-1910. 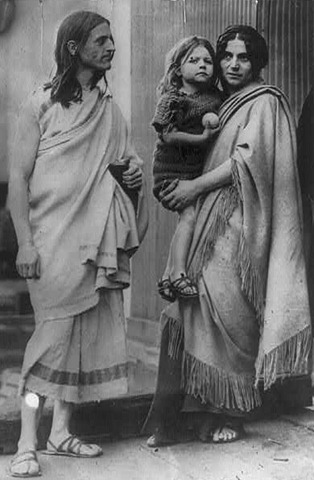 From Wikipedia, Raymond Duncan with his Greek wife, Penelope, and their son, Menalkas, c. 1912. *The Raymond Duncan Collection, which includes his correspondence, newspaper clippings about him, and various other records is housed at the University of Syracuse and is available for perusal by arrangement with the University. Article from the “Harbor Grace Standard” in Newfoundland, Canada, with photos of Raymond Duncan, circa 1949. “New York Times” article about Raymond Duncan’s arrival in Berlin in 1907. Wikipedia information on Raymond Duncan. –This is a fascinating time in Archie’s development as an artist, and if you have further information about Archie from this time period, or Raymond Duncan or this commune I’d like to hear from you!